Hyper-converged infrastructures, such as Nutanix, offer a cost-efficient scale-out architecture for running VDI workloads. While VDI deployment is more simple with hyper-converged infrastructures (as resources are added on demand), performance monitoring poses the same challenges as implementing VDI on traditional physical or virtual servers. 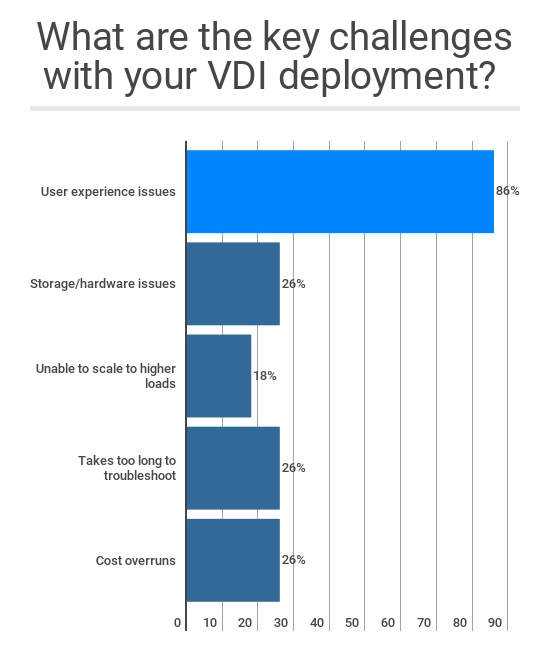 From the above poll results, it is evident that user experience issues are what VDI administrators most challenged with (86% reported user experience issues as the top challenge). When a user complains of slow response time during a virtual desktop session, the VDI administrator has to identify the cause. Let’s take the example of a Citrix desktop virtualization environment: A problem in either the Citrix farm or the underlying Nutanix infrastructure could have caused the slow response time issue. This is not easy to diagnose given the many interdependencies between the various Citrix tiers and supporting Nutanix components (hypervisor, VMs, storage, network). Administrators need access to user experience indicators, performance data for each session, and ICA channel metrics to confirm if the end-user is actually experiencing a slow VDI session. Understanding the availability, health and performance of various tiers in the Citrix stack is important, in order to rule out if it is a Citrix issue or if the problem is arising elsewhere. Then, dependencies will have to be tracked to the supporting Nutanix framework and performance insights correlated to inspect if there is a bottleneck in the hyper-converged infrastructure. Using multiple monitoring tools for Citrix VDI and Nutanix performance can be helpful. But in this scenario, administrators cannot get the correlated insight they need for fast troubleshooting. Enterprises need a unified picture of VDI and Nutanix environments, and end-to-end correlation across every layer and every tier of both infrastructures to isolate the root cause. 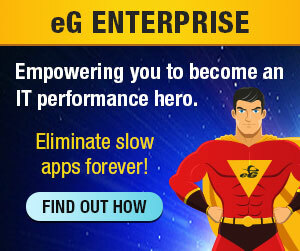 This unified monitoring strategy dramatically simplifies the troubleshooting process and therefore reduces MTTR.